My grades came yesterday. They were worse than I thought. I am not in graduate school or even taking a class at a community center. 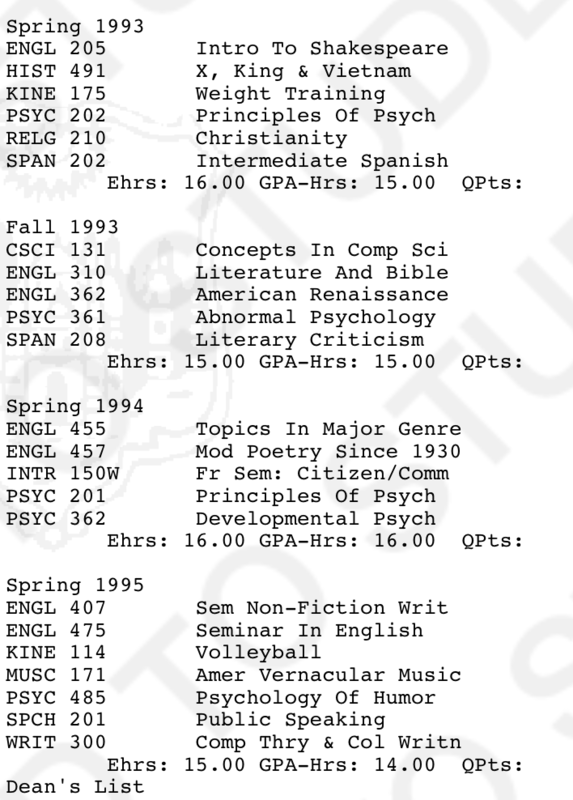 This was my college transcript, from roughly two decades ago. 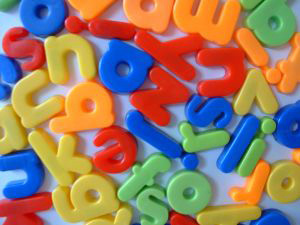 In those 20 years I have built a successful career as a writer, editor, and communications consultant. I’ve worked as in-house communications officer for two organizations and launched my own business 10 years ago. 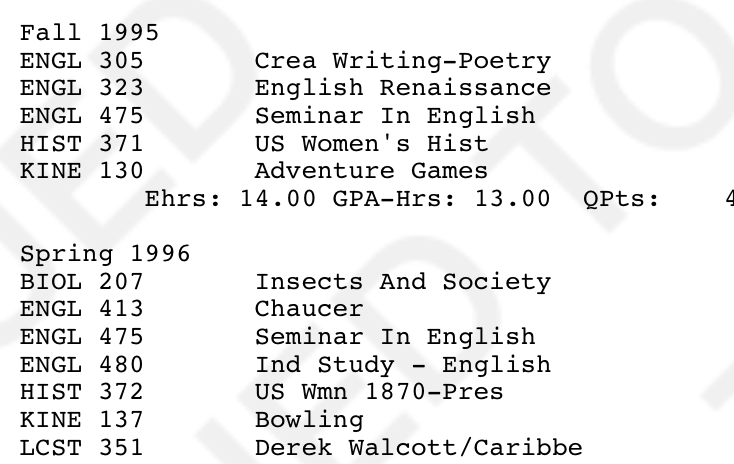 People hire me because I am an excellent writer and editor and no one has ever asked about my grades from college. Until now. I recently had this idea about becoming a substitute teacher at my daughter’s school. I asked Zoe’s teacher and our preschool director for letters of recommendation. I requested my transcript from William and Mary. And when I opened it up, I sighed. My grades were even worse than I remembered. I got a D- in a biology class my first semester. I remember going to talk to the professor after failing the first test, and his words of wisdom were, “you’re an English major, aren’t you?” as if my fate was sealed and I was wholly incapable of succeeding in his class. Things certainly improved from there, but there were many classes in which I earned grades that I did not feel reflected what I had learned. Granted, it’s a tough school, but I had plenty of friends who earned 4.0s or close to it. An illustration of their standards: when I studied abroad for a semester at Oxford University, there was extensive discussion back at William and Mary about whether to accept my transfer credit for a class in British literature. Because, you know, what if the Oxford don doesn’t know as much about British literature as the professors at William and Mary. Perhaps I sound bitter. I don’t mean to. I had a stellar college experience. I enjoyed my time at William and Mary immensely. I dedicated many hours to working on the school paper, which probably helped me in my current work as much or more than many of my classes. I volunteered at the campus child care center and the mental hospital off campus, both for my psychology classes, and helped a Japanese woman improve her English. I went on a work trip to do hurricane relief with my church group. I babysat for and developed strong relationships with families in the community. I made wonderful friends. I obsessively attended a cappella and improv theater performances. I took weight training as a freshman girl with my roommate and a bunch of football players. I rappelled down the back of the stadium in adventure games. I do not regret not studying more. I enjoyed most of the classes I took. I learned a lot. So why do I feel so disappointed in my grades? No one but me is judging me by my transcript. I remember on one of my first days of college when our entire freshman class was gathered in William and Mary Hall. Some administrator welcomed us and talked about how collectively amazing we were. She named how many class presidents, newspaper editors, varsity athletes, valedictorians, etc etc were in our class. She held up one hand in the air, palm down, saying, “in high school, all of you were up here. You were the best of your class.” But any group has to have a spectrum, so now at William and Mary, some of us would be up there, and some of us would be down at the bottom, and some in between. I remember thinking, of course I would still be at the top. But I wasn’t. At least in terms of grades. Are the people who were at the top, who graduated Phi Beta Kappa, any happier or more successful now? I know some of them, and I would venture to say no. Not that they’re unhappy, but they have varying amounts of job satisfaction. They have families and houses and good lives. There’s very little about my life I would change, and anything I would change is completely unrelated to my poor performance in biology. Apparently I made the Dean’s List one semester. I totally did not remember that. But I don’t think that matters anymore, either, if it ever did. If you want to discuss the psychology of humor, or poetry, or women’s history, however I’m down with that. And I did end up acing my writing classes. And I am a writer, so there’s that. It may seem unrelated, but I am also struggling with my disproportionate shame about the state of my house when service providers come to fix things. I’m pretty sure they don’t care if we are messy and it makes no different to them as long as they can do their job and get paid. I know this is all in my head, but I’m not sure how to get it out. In 10 days I will have a birthday. The big milestone birthday for the decade was last year, so this year isn’t anything special, but I’m sure at 41 I should be mature enough not to care about these things. Something to work on for the next 10 days. Or weeks. Or months. Then next year, I’ll be 42 — the secret to life, the universe, and everything, so surely I’ll have figured it out by then.